With only two weeks left in Kenya, and two schools finished with their menstrual workshops, I found myself with a decision to make. Since I am here in service, volunteering my time in the name of menstrual equity and girl power, how could I best be of use? After reflecting over my experiences these past three months, I suddenly realized the answer. Picking up my Kenyan Cell-Phone, I called Golda, Ruby in the Rift project partner and woman extraordinaire, and asked if I could come visit. Ever since meeting her two months ago, I had longed to see her in action and visit the headquarters of the Golden Girls Foundation. Thankfully, she was delighted that I called and welcomed me to her hometown of Kisumu. CONFESSION: Okay, I admit it. I had a few selfish reasons to visit Kisumu as well. First, I was dying to eat fish from Lake Victoria, the second largest freshwater lake in the world. Second, hippos have been my favorite animal since I was three and I was dying to see one in wild; never mind the fact that they are the second most dangerous animal in Africa, after the mosquito (damn you, malaria). I may be 26, but I still want a hippopotamus for Christmas. I packed my bag that night, and braved the journey the next morning. For those of you who haven’t had the opportunity to travel in Kenya, I urge you to take a matatu at least once. Flying down highways, packed to the brim with passengers, swerving around potholes and oncoming traffic, praying for dear life, it really is the most exciting (read: affordable) form of public transit. After five hours (and $6) of solo-female-adventuring through the beautiful unknown that is the Kenyan countryside, I nearly cried tears of joy after finding sanctuary in a Java House (Kenya's version of Starbucks) and satisfaction in a cup of freshly brewed iced coffee. As a foreigner, sometimes its the simple things that bring the most happiness. Golda soon arrived at our meeting point, and we caught each other up about the girls in the Rift Valley and the happenings of her foundation. We also met with three Swedish Master’s students studying Industrial Design and Engineering. Currently, they are completing an internship in Kisumu with a local organization called Zingira Community Crafts that makes goods from recycled products. Their most recent endeavor? Compostable and affordable pads made from local plant material. In particular, these three girls are working on streamlining the pad production process, and had reached out to Golda to get her take on the economic sustainability and practicality of disposable sanitary pads. It just so happened they were visiting the facility the next morning, and we asked if we could join. I hadn’t even been in Kisumu for an hour, and already we were getting down to business. For the first night, we would stay in Golda’s sister-in-law’s house, which was the same house Golda grew up in. Nestled in the hills surrounding Kisumu, I felt right at home. Golda’s two kids volunteered to take me down to the creek below, and I eagerly followed them rock-hopping. I reminisced about my old house in Georgia, and the countless hours I would spend playing by my creek. After dinner, us ladies discussed cultural differences and laughed over Chai. The next morning, we rose early to make it to Zingira Community Crafts by 9:00. As fate would have it, the project manager was Golda’s former student from the University of Nairobi, a kind man named Evance. He explained to us Zinigira was founded in 2001 as a community-based organization that has branched out to include both local and international partners. Although Zinigira typically makes crafts from recycled products, like bicycle tubes for example, they are also working on creating affordable pads for girls in the region. He shared with us his frustrations with menstrual taboos, for example, how some men believe women shouldn’t walk in tomato gardens when they’re menstruating. He also recognized that pads sold in rural villages were unreliably expensive and the average family couldn’t afford the product, especially if they had multiple daughters. In 2016, Zinigira connected with an organization in India, who gifted them rolls of plastic as wrappers and machinery for the pad processing. The coolest part about these pads? They’re made from plant material, specifically hyacinth! Apparently, hyacinth is an invasive species that has been gradually taking over Lake Victoria. Local women who rely on fishermen coming to shore to sell their fish have also been affected because the bay is becoming overgrown. That's when Zingira stepped in, helping women to clear the lake's shoreline, while also teaching them how to weave baskets out of the plant so that they have two forms of income. Mixed with other fibers, hyacinth is a viable pad material. It's an example of a sustainable solution that also serves a necessary ecological function. Zinigira's process improves the vitality of Lake Victoria, and benefits low income women. As if this product couldn’t get any better, a company in Sweden recently donated rolls of plastic that are biodegradable, making the entire pad, and even its wrapper, environmentally friendly. It's inspiring stuff, and my hope is that these Swedish students can streamline the process even more, so local schoolgirls can have access to an affordable and environmentally friendly sanitation solution! After our meeting, we went to the city center to visit the Kisumu Museum. It was a chance for me to learn more about the culture, history, and animals of Western Kenya. Golda acted as the tour guide and walked me through the traditional huts and explained the meaning behind their peculiar layouts. She explained to me the significance of a "simba", a hut built by a son when he reaches a certain age. Once he gets married, the simba is typically torn down and he is expected to build a new home on a piece of land given to him by his family. I was impressed by the simba's simplicity, and wondered about the clutter us westerners have become so accustomed to; burdened by sentimental attachments to material things. Peering through the window of one of the huts, I couldn't help but notice an clan of tribal members. At last! A room with a view. As we started walking towards them, the group welcomed our presence with song and dance. They grabbed Golda, and she pulled out some impressive Luo dance moves I had never seen before. Then they turned their eyes on me. I know better than to try to outrun a Kenyan, so I accepted their offer to dance. WARNING: The video below contains footage of a Mzungu trying to dance. Watch at your own risk. Complications could include laughter. After the tour and dance-off, we finally made it to the shore of Lake Victoria. Golda guided me to the entrance of a waterfront restaurant, where we hand picked our fish and were soon brought ugali and sukuma wiki. While we were waiting, I told her how this was a bucket list item for my time in Kenya and we laughed over the phrase "kick the bucket". After out late lunch, we grabbed a matatu and headed towards Masago, the headquarters of the Golden Girls Foundation. As we were riding along, Golda explained to me a Kenyan tradition. Golda’s husband, Ben, grew up in this village. Traditionally, when a woman marries, she becomes part of his village. When Golda first came to Masago, a self described “city girl”, she was an outsider and had to work hard to earn the local’s trust. Fast forward ten years, and she has a foundation supporting local women and a local school. 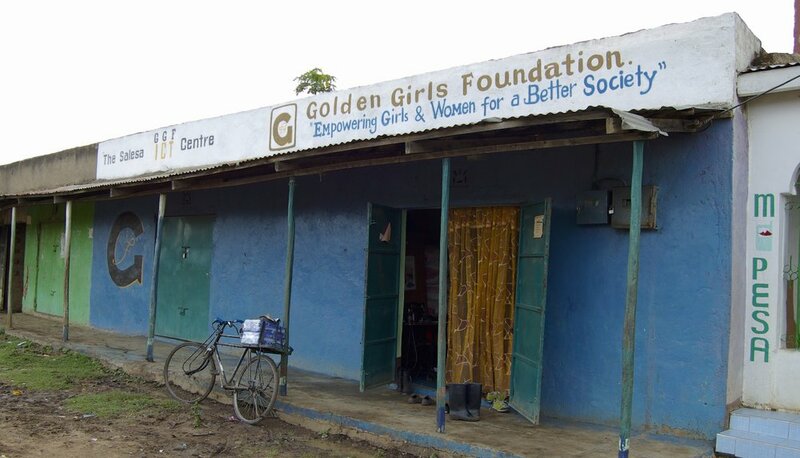 Headquarters of the Golden Girls Foundation in Masago, Kenya. At the office I met Ron, an Israeli traveling the world, looking for service, and two girls from Czech Republic on a internship with their university. Ron and I hit it off immediately, and she and I talked nonstop on the forty minute walk home. I would be spending the night in Golda’s husband's old simba. There’s a balance between tradition and practicality, and Golda and Ben decided to leave the dwelling for volunteers with the foundation. The house was charming, despite the fact it lacked running water and electricity. I cozied up on the porch, and gazed up at the stars. I finally was able to tour the foundation and visit the primary school built by the Golden Girls Foundation. Currently, it offers three different class levels. Afterwards, we loaded up the crew on three motorbikes. We were heading back to the city center for a Ruby Cup Distribution. I had a feeling such an event might occur, and packed my shirt just in case. The task at hand? Educating, educating, and distributing cups to a boarding school with over 500 secondary students. When in doubt, divide and conquer. Golda sent me in first with Ron as the ice breaker, and we taught the girls a lesson on the internal anatomy of the female reproductive system and the parts of the menstrual cycle. Up next, a team went in with Ruby Cup surveys. Golda then would follow suit and introduce the girls to the Ruby Cup. 12 classrooms later in rapid succession, we did it. 523 more cups made it to girls in Kenya! The best way to celebrate a successful distribution? A day in the city. 1. Java House: The volunteers in the village live without water, wifi, and electricity. In order to complete their projects and help with the social side of the foundation, a morning at an internet cafe is a necessity. The coffee is just a bonus. 2. Market: I must admit I love exploring a city by foot, and sampling the local market scene is always a must. I love seeing the homemade crafts, from the sandstone carvings to the paintings, from the beaded bracelets to the intricate masks. 3. Black Panther: How could one not go see the new marvel movie while in Africa? I couldn't help but notice some swahili words spoken by the character's of Wakanda. 4. At long last, I can officially kick the proverbial Kisumu bucket. We took a boat from Hippo Point in search of my favorite creature. Stormy skies, sunsets, and of course, HIPPOPOTOMUSES!! My last full day in Kisumu. Golda took us to a village just outside of Kisumu called Tiengre. There, we spent the day at the Cherry Brierly Children's Home, a heart-warming home amidst the harsh reality these children face. Golda's two children joined us for the excursion, as they are friends with the children that live there. 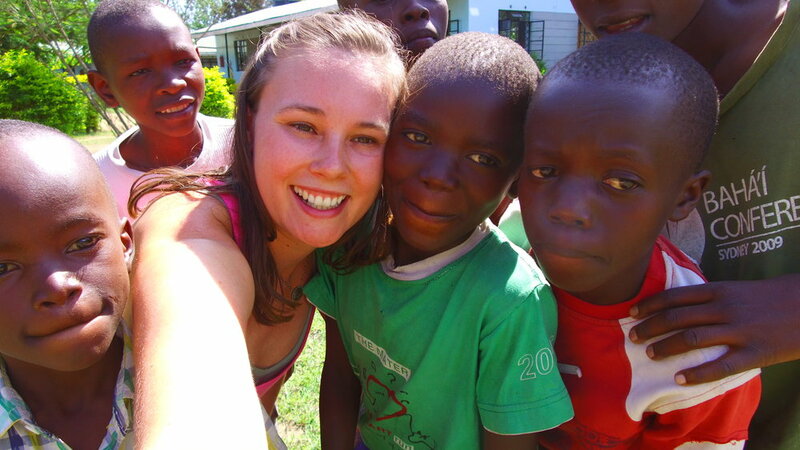 With the ability to support up to fifty children, this orphanage is all inclusive. Children from age eight to eighteen are provided with a bed, food, and an education. Most importantly, they are given love. Staff members include a "mom" and a "dad" who live on the property full time, offering support and guidance to these young ones. We spent the whole day with the children, as they treated us with song, dance, poetry. We shared with them games from our respective countries and conversation. The weekend drew to a close, and it was time for me to return to my home away from home: Iten. Six hours of public transit, and five marriage proposals later, I made it. Time to gear up for my last week of class.